Sonam Kapoor is perhaps one of the most fashionable B-town celebs in the town and be it her red carpet outings or her street style, she never fails to make heads turn with her sartorial choices. 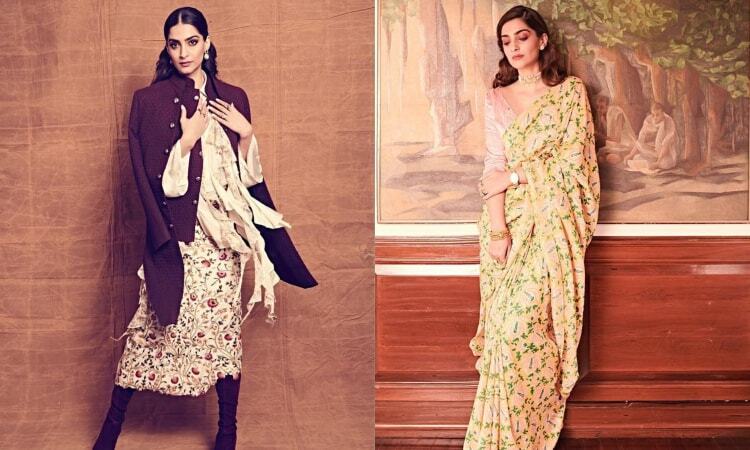 Now as Sonam is busy promoting her upcoming film Ek Ladki Ko Dekha Toh Aisa Laga, which also stars Anil Kapoor, Rajkummar Rao and Juhi Chawla, she is leaving no stone unturned to impress us, one outfit at a time. For one of the promotional events, Sonam was spotted wearing a floral Anamika Khanna outfit and she looked gorgeous, as ever. Her sister and stylist Rhea Kapoor paired Sonam's floral dress with a double layered brown bandhgala from Kunal Rawal and matching boots. She has accessorised her look with a pair of earrings and a finger ring from Amrapali Jewels. Subtle makeup done by Mehak Oberoi and with her tresses neatly tied and left into loose curls complemented her attire. Meanwhile, for another promotional outing, Sonam opted for a pretty floral sari in yellow and light pink from JODI. She left her hair open and completed her look with minimal jewellery from Amrapali Jewels and Anmol Jewellers. She certainly looked like a breath of fresh air, doesn't she? Ek Ladki Ko Dekha Toh Aisa Laga is slated to release on February 1.